45 Years is a 2015 British romantic drama film directed and written by Andrew Haigh. The film is based on the short story "In Another Country" by David Constantine. The film premiered in the main competition section of the 65th Berlin International Film Festival. Charlotte Rampling won the Silver Bear for Best Actress and Tom Courtenay won the Silver Bear for Best Actor. At the 88th Academy Awards, Rampling received a nomination for Best Actress in a Leading Role. The film takes place across six days, marked by intertitles. Five years after retirees Kate and Geoff Mercer had to cancel their 40th wedding anniversary because of his heart bypass surgery, the comfortably-off, childless Norfolk couple are preparing to celebrate their 45th anniversary with dozens of friends at the Assembly House in Norwich. A week before the anniversary party, they gently discuss the music that will be played. The first song from their wedding 45 years ago is their choice for the opening dance again — this is a song that Geoff has always liked. Their morning is somewhat disturbed when Geoff opens a letter from Switzerland telling him that the body of Katya, his German lover in the early 1960s, has become visible in a melting glacier where she fell into a crevasse on their hike with a guide over five decades ago. Memories rush back to him and he realizes he has forgotten much of what little German he used to know and that he would need a dictionary to fully understand all that the letter says. Kate has been told about Katya previously by Geoff and seems initially unconcerned by his controlled disquiet. But gradually, Geoff's conduct begins to show that there is more on his mind than he says. Among other things, he tries to keep from Kate that he is beginning to take steps to fly to Switzerland without her to see Katya's body, which he imagines preserved in the now-transparent ice, still looking youthful. Prompted by Kate, Geoff talks about his relationship with Katya and thoughts evoked by the discovery of her body. He tells Kate that he and Katya had pretended to be married in order to be able to share a room in the more puritanical early 1960s. Because of this, the Swiss authorities consider him to be Katya's next of kin. Kate asks if they planned to be married and Geoff states confidently that they would have. While Kate is troubled by the revelation, she tells him: "I can hardly be cross about something that happened before we even existed... still..."
As the days pass and preparations for the party continue, Geoff continues to be moody and takes up smoking, which both had given up in the past. One night, Geoff climbs into the attic to look at his memorabilia of Katya and only reluctantly shows Kate a picture of Katya, when she angrily insists. Kate notices that in addition to their similar names, Katya appears to look much like Kate did when she was young, with the same dark hair. Kate starts to ponder all of her life with Geoff and their possible rebound relationship, and even begins "to smell Katya's perfume" in every room. While Geoff is out at a reunion luncheon at his former workplace, Kate climbs the ladder to the attic to seek what he might be keeping there. She finds Geoff's scrapbook filled with memorabilia from his time with Katya, including pressed violets from their last hike. She finds a carousel slide projector, loaded with images of Switzerland and Katya, next to a makeshift screen to view them. Kate is shocked to see slides showing Katya with her hand on top of the curve of her abdomen: Katya was pregnant at the time of her death. Kate also takes up smoking again and, upon learning of his visit to the local travel agency to inquire about trips to Switzerland, confronts Geoff about his recent behavior related to Katya, without revealing what she saw in the attic. She says that she now believes that many of their decisions as a couple, including their many German Shepherds (and implicitly not having children), were influenced by Katya. Geoff promises that their marriage will "start again," which the next morning he marks by serving her tea in bed and making breakfast for her. They attend their anniversary party in the historic Grand Hall. Kate is constrained, distracted, and remains impassive during Geoff's speech in which he professes his love for Kate, while saying "the choices we make in our youth are most important". He brings himself to tears during the extremely personal and emotional speech, just as Kate's friend Lena has predicted men always do at weddings and anniversaries. Kate seems fleetingly heartened by the conclusion of his speech. The first dance is announced, which is to be the same first song from their wedding, "Smoke Gets in Your Eyes" by The Platters. As Geoff and Kate slow dance, she becomes increasingly awkward and rigid, while he becomes silly and playful. Kate appears to be interpreting that the significance of the song, which is about loss, relates to Geoff's feelings for Katya. As the song ends, Geoff raises their hands together in the air as the party guests cheer, but Kate yanks her arm down. Geoff, apparently oblivious, dances away. The final close-up isolates Kate amid the mass of people on the dance floor as mixed emotions play across her face. The review aggregator website Rotten Tomatoes reports a 97% approval rating with an average rating of 8.6/10, based on 186 reviews. 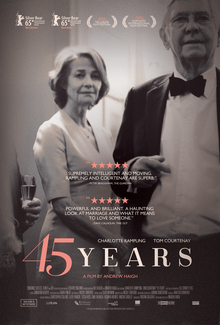 The website's critical consensus reads, "45 Years offers richly thought-provoking rewards for fans of adult cinema – and a mesmerizing acting showcase for leads Charlotte Rampling and Tom Courtenay." On Metacritic, it has a weighted average score of 94 out of 100 based on 36 reviews, indicating "universal acclaim." ^ a b Shute, Joe (29 August 2015). "The true story (behind the story) that inspired 45 Years". Retrieved 2 March 2018 – via www.telegraph.co.uk. ^ "45 Years (15)". British Board of Film Classification. 24 June 2015. Retrieved 24 June 2015. ^ "45 Years (2015)". The Numbers. Retrieved 21 March 2016. ^ Gant, Charles (6 February 2015). "Berlin Film Review: '45 Years'". Variety. Retrieved 30 July 2015. ^ a b "Prizes of the International Jury". Berlinale. Retrieved 14 February 2015. ^ a b "Oscar Nominations: The Complete List". The Hollywood Reporter. 14 January 2016. ^ "45 Years". IFC Films. Retrieved 16 February 2016. ^ "45 Years (2015)". Rotten Tomatoes. Fandango Media. Retrieved 22 August 2018. ^ "45 Years". Metacritic. Retrieved 2 February 2016. ^ Kermode, Mark (30 August 2015). "45 Years review – a very stylish marriage". Retrieved 18 June 2016. ^ "Baftas 2016: full list of nominations". The Guardian. 8 January 2016. ^ "The Lobster on a roll with seven British independent film awards nominations". The Guardian. 3 November 2015. ^ "'Spotlight' Named Best Film of 2015 by Boston Society of Film Critics". Variety. 6 December 2015. ^ ""Mad Max: Fury Road" Leads The Race For 2015 CFCA Awards". Chicago Film Critics Association. 14 December 2015. ^ "Critics' Choice Awards Mad For 'Max' But Produces Few Shockers In First Combined Nominations For TV & Film". Deadline. 14 December 2015. ^ "Dallas-fort Worth Film Critics Name "Spotlight" Best Picture Of 2015". Dallas–Fort Worth Film Critics Association. 14 December 2015. ^ "Film dell'unione europea". David di Donatello. ^ "'Carol' Earns Multiple Mentions as Dorian Award Nominees Are Unveiled". The Hollywood Reporter. 12 January 2016. ^ "2015 Dublin Film Critics Circle Awards Announced". entertainment.ie. 22 December 2015. ^ "45 Years scoops Edinburgh film festival's top award". The Guardian. ^ "Empire Awards nominations 2016: Mad Max and Star Wars lead the pack as Leonardo DiCaprio nominated for Best Actor". London Evening Standard. 18 February 2016. ^ "'Youth,' 'The Lobster' Lead European Film Award Nominations". Variety. 7 November 2015. ^ "Evening Standard British Film Awards: The longlist". London Evening Standard. 22 December 2015. ^ "Evening Standard British Film Awards 2016: Idris Elba and Dame Maggie Smith lead list of winners". London Evening Standard. 7 February 2016. ^ "'Carol' leads 2015 Florida Film Critics Awards Nominations". Florida Film Critics Circle. 21 December 2015. ^ "Indiewire 2015 Year-End Critics Poll". Indiewire. ^ "IFTA 2016 Nominees". IFTA. ^ "'Carol,' '45 Years' and Tom Hardy Lead London Critics' Nominations". Variety. 15 December 2015. ^ "LAFCA awards best picture prize to 'Spotlight'". Screendaily. 6 December 2015. ^ "'Mad Max: Fury Road' Named Best Film By National Board Of Review; 'The Martian' Grabs Three Awards". Deadline. ^ "National Society of Film Critics Names 'Spotlight' Best Picture". The Hollywood Reporter. 3 January 2016. ^ "New York Film Critics Online Name 'Spotlight' Best Film of the Year". Variety. 6 December 2015. ^ ""Carol" and "Sicario" Lead the 19th OFCS Nominations". OFCS. 7 December 2015. ^ "2015 San Francisco Film Critics Circle Awards". San Francisco Film Critics Circle. 13 December 2015. ^ "Rams' humanism wins over the jury at Valladolid". Cineuropa. This page was last edited on 9 February 2019, at 17:52 (UTC).